The quiet, diffident Michel Maret runs this fine domaine with his two engaging daughters, Caroline and Veronique. Founded by his great-grandfather in 1912, it comprises a number of parcels scattered around the appellation, with the best of them in the Le Crau sector, near to Vieux-Telegraphe, with its stony galets roules soil, in all a varied range of soils ranging across limestone, clay, sand and stone. There is also a 10 hectare parcel in the village of Vacqueyras. The domaine came onto my radar a couple of years ago, and I feel confident that it is offering some of the finest values in the entire appellation. The richly accessible, authentic Vacqueyras and the mere 170 cases of superb white Chateauneuf apart, there are a handful of cuvées headed up by the full, plummy Cuvée Domaine, 70% Grenache with the balance shared equally between Mourvèdre and Syrah, the Les Hautes Brusquières from 30-50 year old Grenache and Syrah, Cuvée Mourre des Perdrix from similarly-aged Grenache, Syrah and Mourvèdre, and the very fine, supple Cuvée Vieilles Vignes, from 90 year old Grenache and a dash of Mourvèdre with some sensible small barrel-ageing, perhaps the pick, should there have to be one, of an excellent lineup. 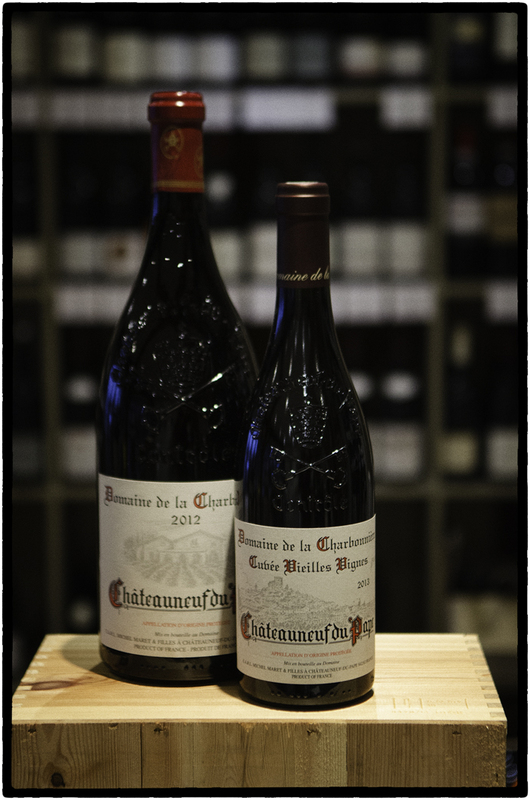 Recent tastings of the superb 2015 and 16 vintages have proven beyond doubt that this increasingly a serious source of warmly delicious, well-balanced Chateauneuf, and a useful tip to the canny lover of these fine Grenache-based wines.